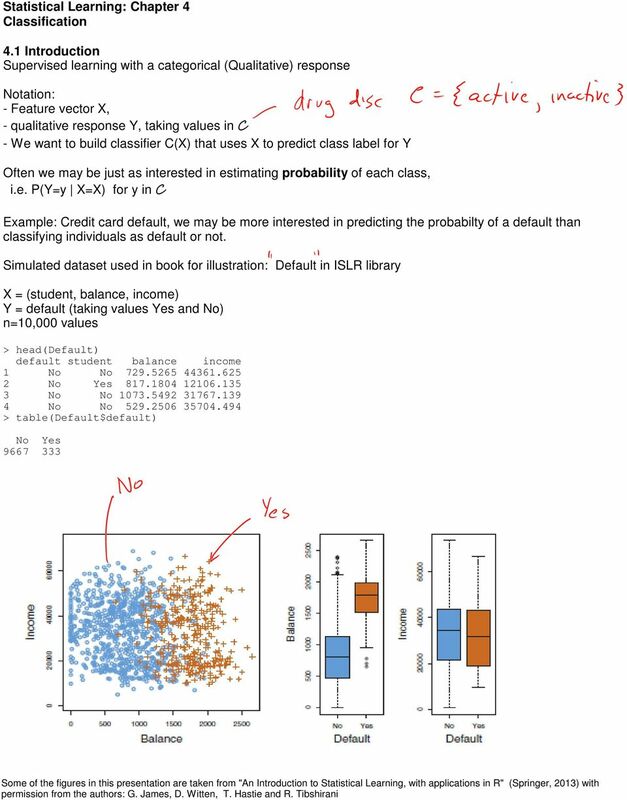 Download "Example: Credit card default, we may be more interested in predicting the probabilty of a default than classifying individuals as default or not." 5 We can also make predictions for the effect of being a student on defaulting on your loan. 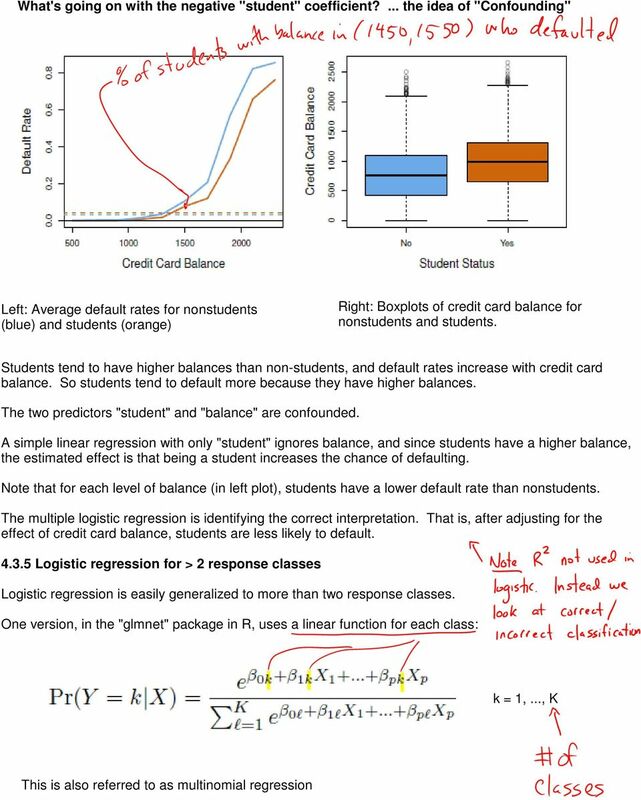 First fit the logistic regression model: It appears that students are more likely to default on a loan than non-students. 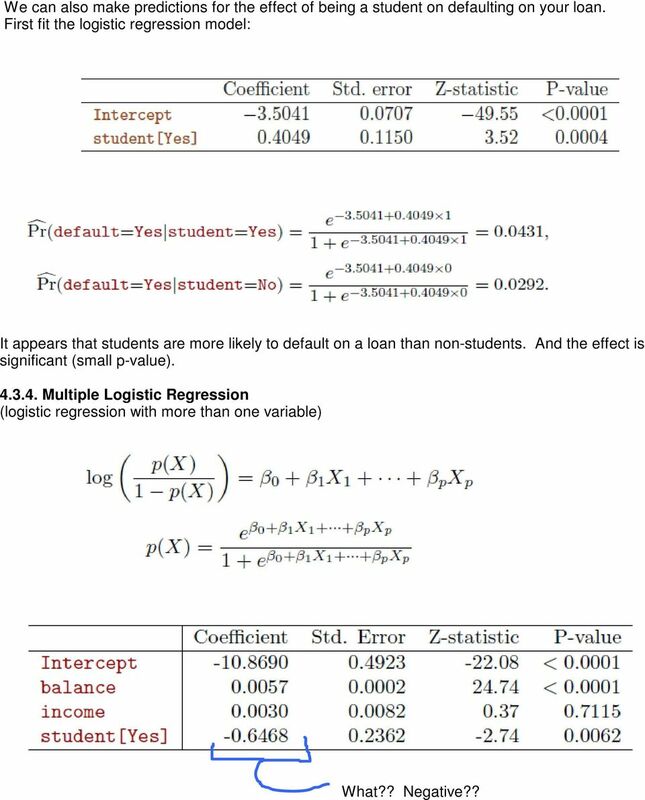 And the effect is significant (small p-value) Multiple Logistic Regression (logistic regression with more than one variable) What?? Negative?? 8 4.4.2 LDA for p=1 dimension Example: - Both rows: x in one class is N(-2,1), the other N(1,1) - Top row: pi1 = pi2 = Bottom row: pi1 =.8, pi2 =.2 Mathematical details: The Gaussian density has the form NOTE: we assume for now that variances in all classes are equal. 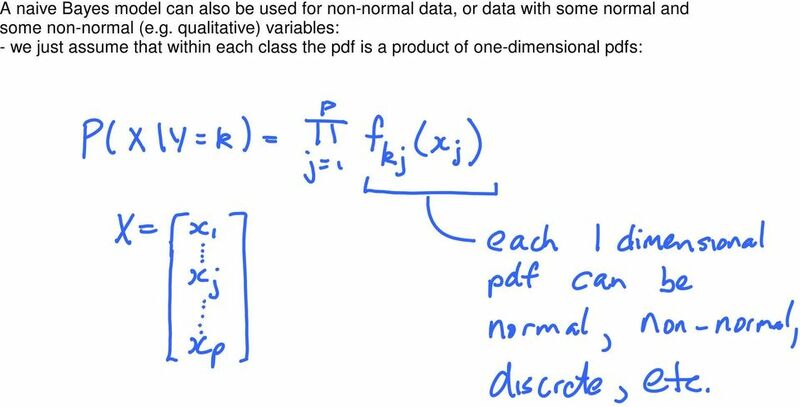 11 The univariate normal densities in the previous section are replaced by multivariate normal density functions. 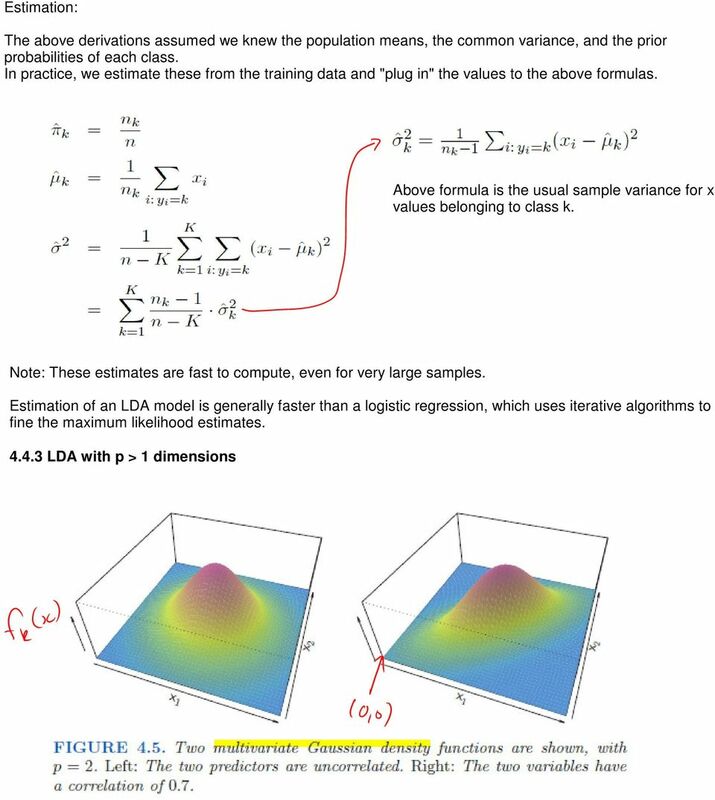 They have the form: The covariance matrix determines the shape of the density. It also determines the correlations between the different elements of the vector x. 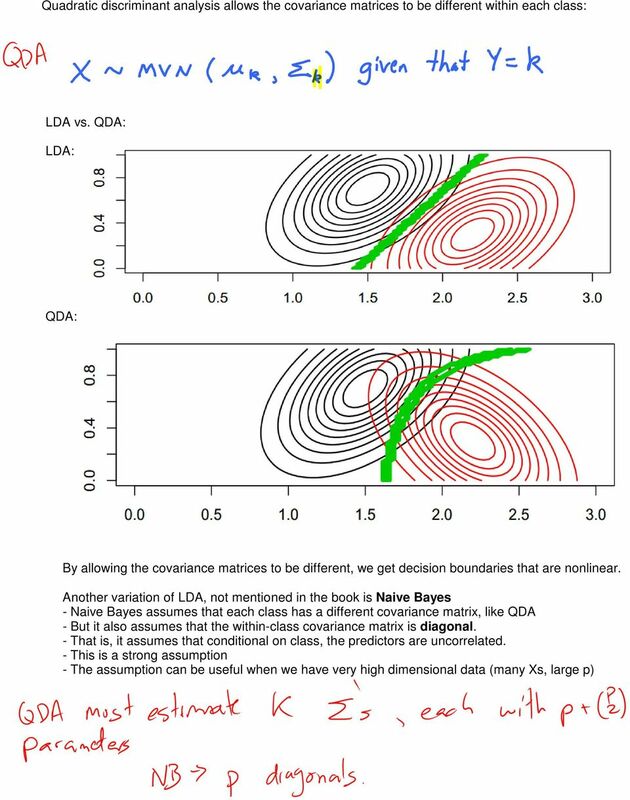 The plot on the previous page shows two cases, one where the covariance matrix is the identity, the other where it has diagonal elements of 1 and off-diagnoal elements of 0.7. 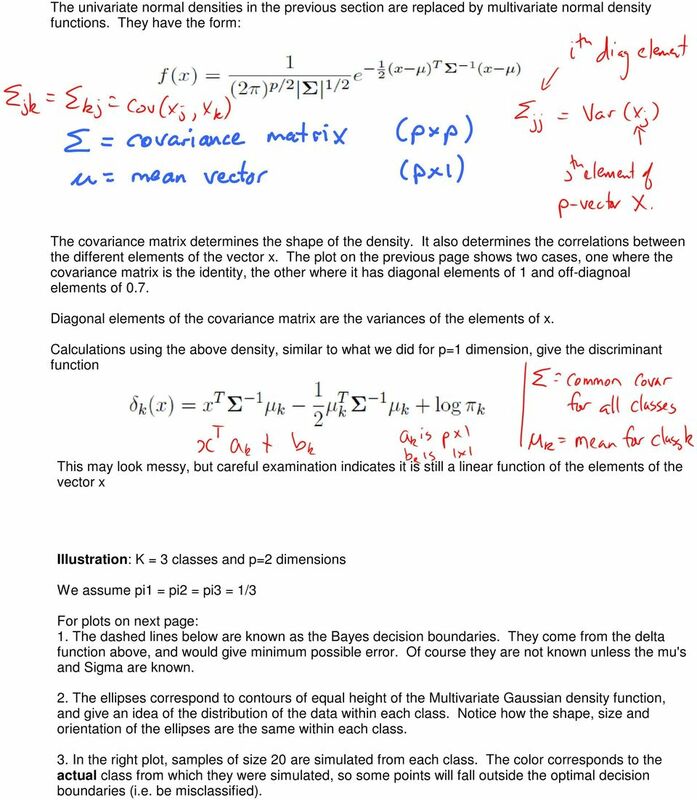 Diagonal elements of the covariance matrix are the variances of the elements of x. Calculations using the above density, similar to what we did for p=1 dimension, give the discriminant function This may look messy, but careful examination indicates it is still a linear function of the elements of the vector x Illustration: K = 3 classes and p=2 dimensions We assume pi1 = pi2 = pi3 = 1/3 For plots on next page: 1. 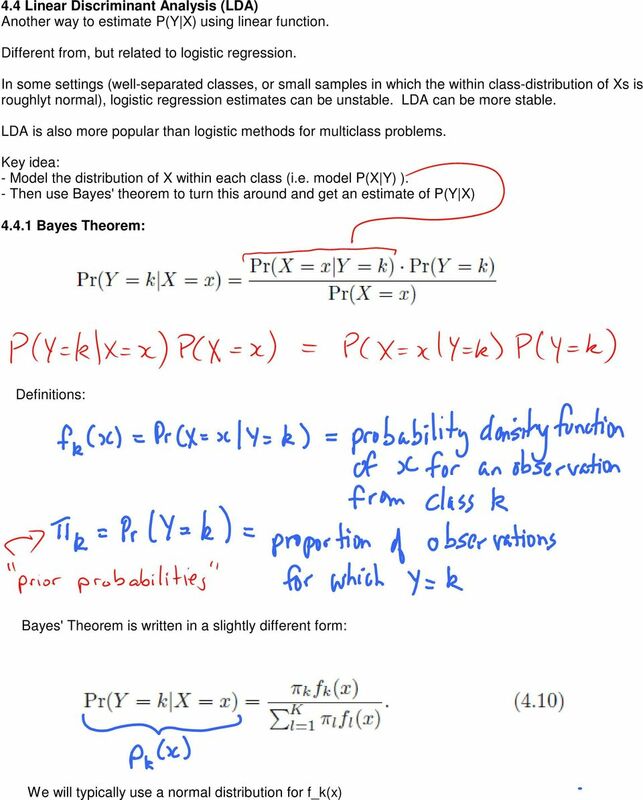 The dashed lines below are known as the Bayes decision boundaries. 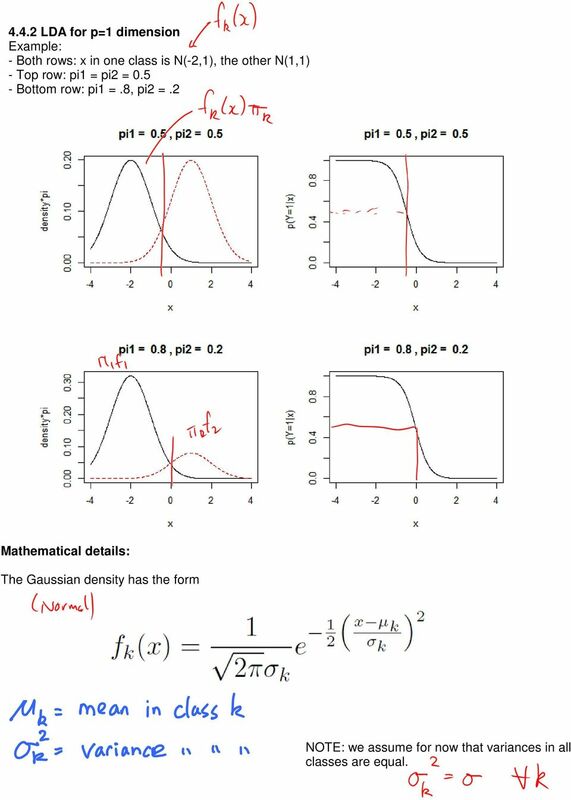 They come from the delta function above, and would give minimum possible error. Of course they are not known unless the mu's and Sigma are known. 2. 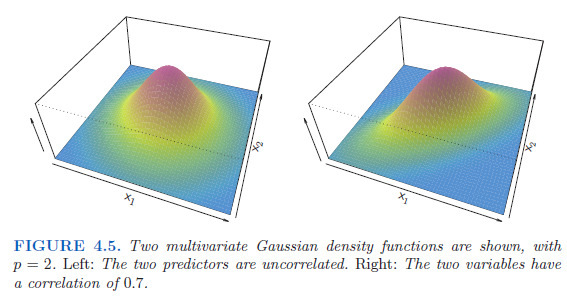 The ellipses correspond to contours of equal height of the Multivariate Gaussian density function, and give an idea of the distribution of the data within each class. Notice how the shape, size and orientation of the ellipses are the same within each class. 3. In the right plot, samples of size 20 are simulated from each class. 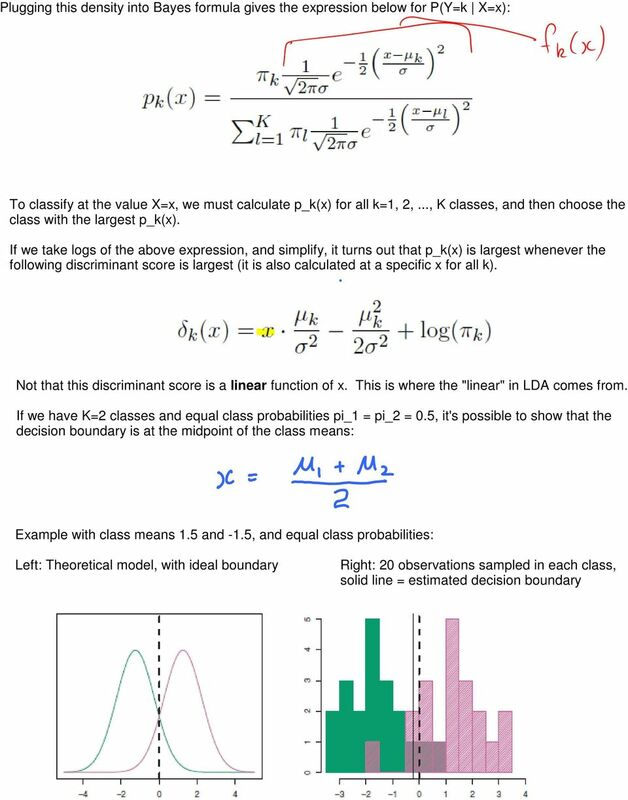 The color corresponds to the actual class from which they were simulated, so some points will fall outside the optimal decision boundaries (i.e. be misclassified). 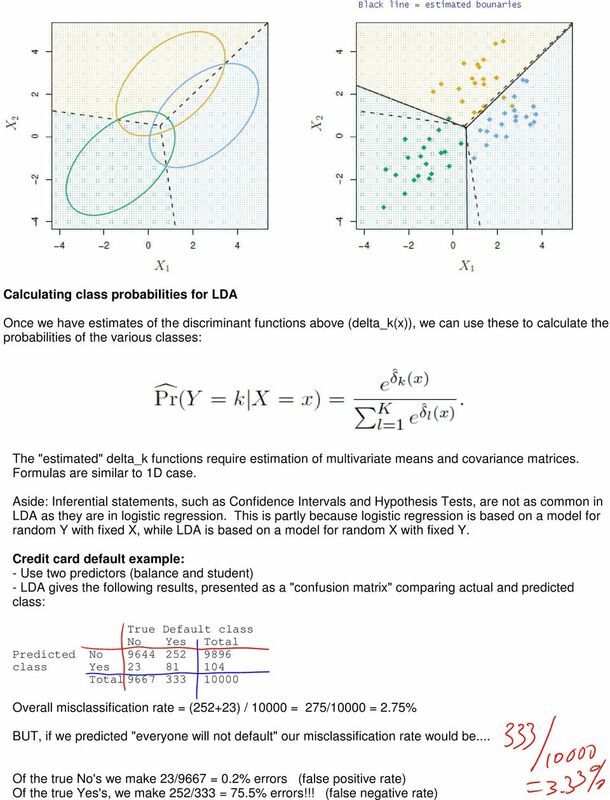 13 Problem: we predicted classes using a threshold of 0.5 for the predicted class probability. - This minimize overall misclassification rate - But it is doesn't give accurate predictions for the "yes" class. 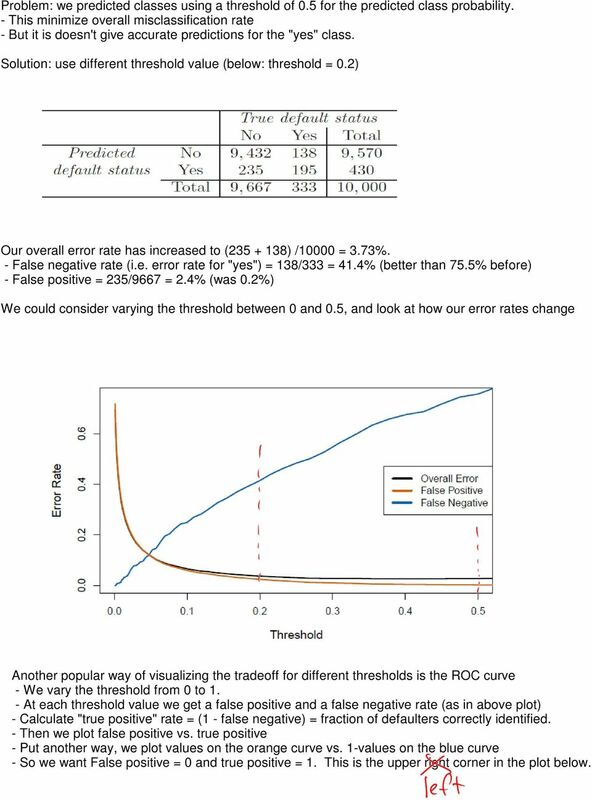 Solution: use different threshold value (below: threshold = 0.2) Our overall error rate has increased to ( ) /10000 = 3.73%. - False negative rate (i.e. 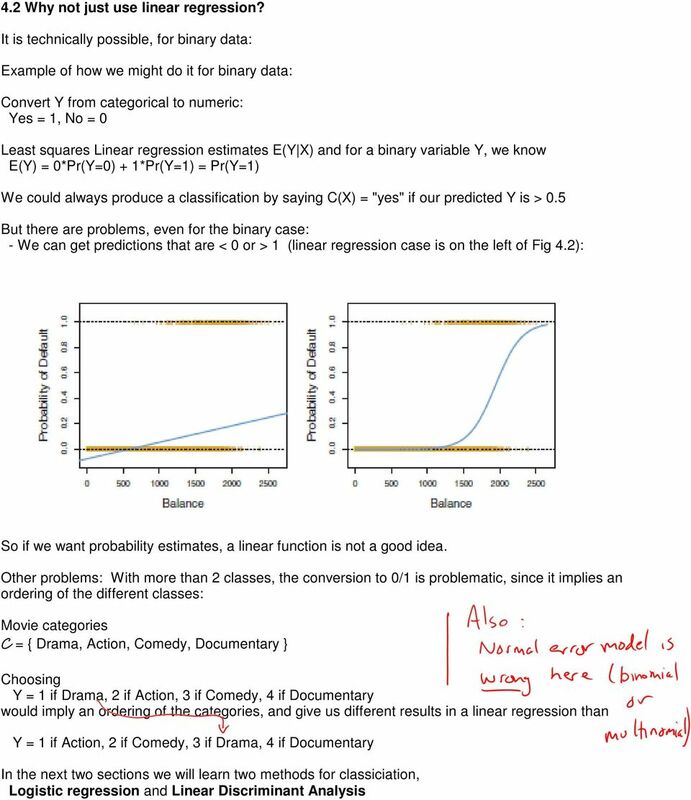 error rate for "yes") = 138/333 = 41.4% (better than 75.5% before) - False positive = 235/9667 = 2.4% (was 0.2%) We could consider varying the threshold between 0 and 0.5, and look at how our error rates change Another popular way of visualizing the tradeoff for different thresholds is the ROC curve - We vary the threshold from 0 to 1. 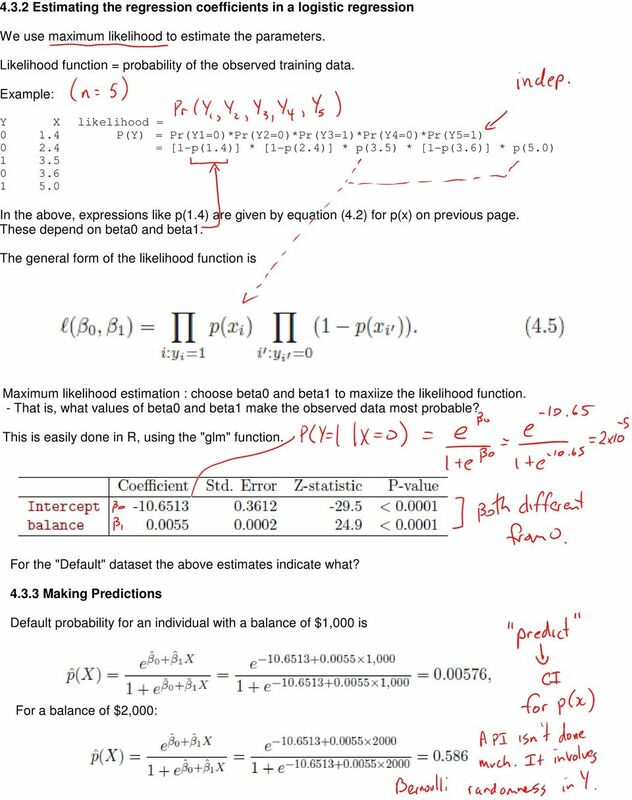 - At each threshold value we get a false positive and a false negative rate (as in above plot) - Calculate "true positive" rate = (1 - false negative) = fraction of defaulters correctly identified. 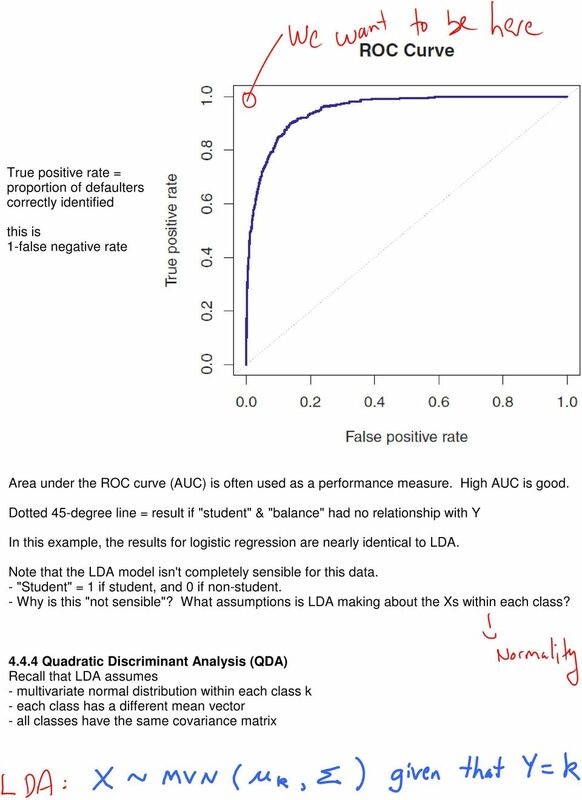 - Then we plot false positive vs. true positive - Put another way, we plot values on the orange curve vs. 1-values on the blue curve - So we want False positive = 0 and true positive = 1. This is the upper right corner in the plot below. 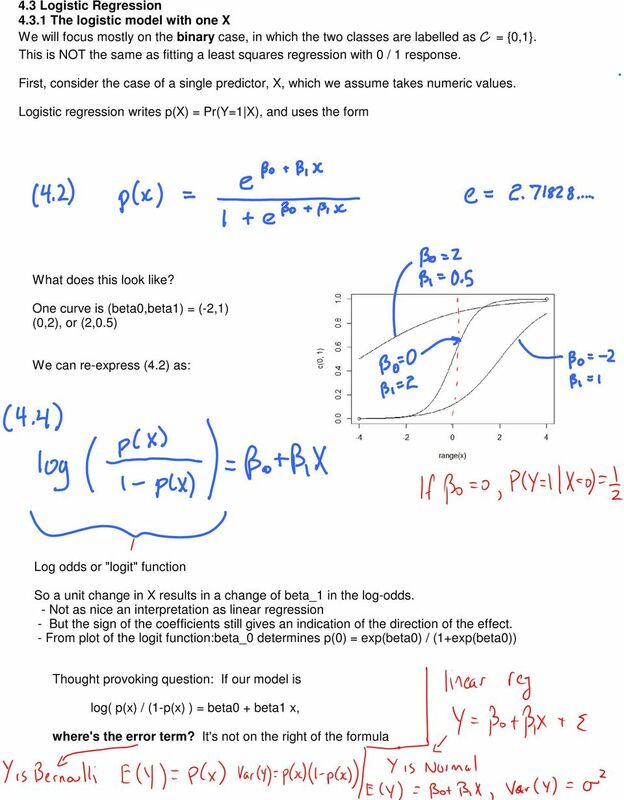 Response variables assume only two values, say Y j = 1 or = 0, called success and failure (spam detection, credit scoring, contracting.